SCANDEM 2017 was a successful Conference. See here an information package with pictures. It is with great pleasure to announce that SCANDEM 2017 - The 68th Annual Conference of the Nordic Microscopy Society – will be held in Reykjavík from Monday 5th to Thursday 9th June 2017 (see http://scandem2017.hi.is/). SCANDEM 2017 is hosted by the University of Iceland, organized jointly by the School of Engineering and Natural Sciences and the School of Health Sciences, in collaboration with the Innovation Center Iceland. The University of Iceland is a progressive educational and scientific institution, renowned in the global scientific community for its research. Its main campus, the venue of SCANDEM 2017, is situated in the heart of Reykjavík, only few minutes’ walk to the city centre, the Parliament House, the City Hall, Reykjavík harbour and Harpa Concert Hall. Háskólatorg will be the main location of the conference, housing lecture rooms, trade exhibition and poster area, canteen and recreation facilities. The conference opening and the first plenary session will take place in the Celebration Hall of the main building (see picture). 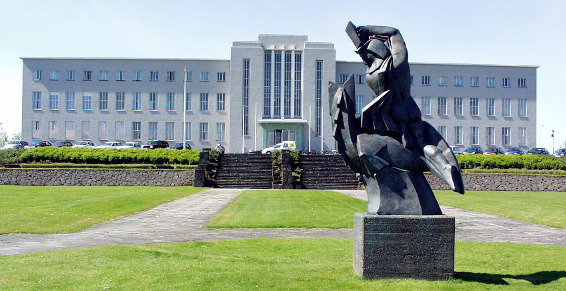 The pre-conference workshop will be in Askja, the Natural Science Building. The Nordic House is situated between Askja and Háskólatorg. Conference participants may find home atmosphere in this Nordic cultural centre, art exhibitions and fine dining. SCANDEM was founded in 1948. It has since then served as an active organization focusing on all aspects of and related to microscopy. To promote knowledge of microscopy, SCANDEM coordinates meetings, courses and workshops. The society’s annual conference is organized by a local committee alternating between the Nordic countries. This year 2017 it is Iceland’s turn to host the society’s annual conference. SCANDEM 2017 focuses on the latest development and applications of microscopy in materials and life sciences. The scientific programme has been organized following two themes and four sessions in each:  Life sciences, including (a) technology and methods, (b) health and biomedical applications, (c) cellular and organismic biology, and (d) environment in the global context; and  Physical sciences including (a) technology, instrumentation and methods, (b) materials and nanoscience, (c) geology, volcanology and earth sciences, and (d) industrial applications. The scientific programme features two plenary lectures, eight keynote lectures, and numerous presentations by conference participants in parallel sessions, poster sessions and trade exhibition. Two plenary lectures sponsored by the University of Iceland include:  microscopic analysis of the breast cancer genome (Nat Commun 2016, 7) by Jórunn E. Eyfjörð from the Faculty of Medicine and  carbon fixation into the volcanic rock (Science 2016, 352) by Sigurður R. Gíslason from the Faculty of Earth Sciences. Keynote speakers on physical sciences include Peter Nellist (EMS-sponsored) from Oxford University, UK; Joanne Etheridge from Monash University, Australia; and Yubin Zhang from the Technical University of Denmark. Keynote speakers on life sciences include Terezie Mandakova (EMS-sponsored, workshop) from Masaryk University, Czech Republic; Eeva-Liisa Eskelinen from University of Helsinki, Finland; Björn Högberg from Karolinska Institutet, Sweden; Gerald Kleywegt from EMBL-EBI Cambridge, UK; and Carolyn Rasmussen from the University of California at Riverside, USA. The online registration is now open. Abstract submission deadline is 24th March 2017. Early online registration deadline is 30th April 2017. Student travel grant application deadline at www.scandem.org/membership-info/grants is also 30th April 2017. NTNU - EBSD Meeting is organized in connection to SCANDEM2016. More information and the registration form. OleiniTec and Thermo Scientific are organizing free Microanalysis educational workshops 1 Oct 2015 at Stockholm and 24 Nov 2015 at Copenhagen.